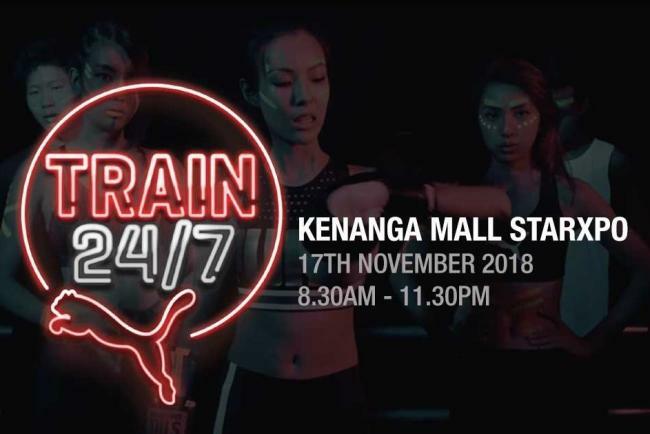 Global sports brand PUMA presents an all-new fitness event called ‘PUMA TRAIN 24seven Malaysia’ featuring a combination of different types of workout under one roof. The full day event will be happening on 17th November 2018 at Kenanga Star XPO. Only a month away, the event has been making waves in the fitness circle with tickets selling fast. If you have not made up your mind on whether to sign up, here are not one, but FIVE reasons why you should be there. Participants can choose up to six different workouts that you might otherwise never get a chance to experience at such an affordable price. From the well-known HIIT training to the fun Glow Dance, the event will divide the nine training routines into three core segments, namely persistence, pace, and power. Some of the mentionable routines are ZUU movement and Jumping® Fitness trainings. What is even better than a revolutionary fitness event? An event that offers freebies and goodies to the participants! Participants are set to receive an exclusive PUMA Tote bag, a PUMA tee and an amusing Resistance Band that can be used for other fun routines later on. Known to be instrumental figures of endurance and strength, you will have the opportunity to be trained by highly qualified instructors such as Stephen Thomson (ZUU Movement), TRIBE Boxing (Rhythmic Boxing), Ain Ramli (HIIT), Faith Rundi (Glow Dance), among others. 5. The lit After Party! Who said fitness and fun do not go together? Keep your energy up high as PUMA is set to host an after party for all the participants. The full-day street-inspired training event aims to drive home the point that there is no one way to run or train anymore. The street is now your playground! The tickets are selling out fast, so quickly register here and grab the early birds deals NOW!